Mui Ne is a nice resort area in Phan Thiet, near Ho Chi Minh City (south Vietnam). Northeast of Phan Thiet the coastal road climbs over the slope of a Cham-Tower-topped hill and descends onto the long, sandy crescent of Mui Ne Bay. 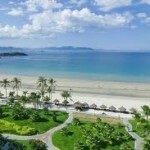 The formerly little-inhabited beach south of the fishing village of Mui Ne proper has seen some serious development in the last 15 years. 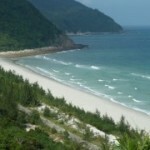 Now it is a 15 km long strip of resorts that line up like pearls on Nguyen Dinh Chieu street, shaded by coconut palms. The main resort strip lies between the addresses of 2 and 98 Nguyen Dinh Chieu and is actually named Ham Tien. Many overseas visitors reach Mui Ne via “Open Tour” buses that run between Ho Chi Minh City and Nha Trang. Most depart from HCMC between 7:30 and 9:00AM or PM. In the opposite direction, buses typically depart from Mui Ne around 2:00PM or AM and arrive in HCMC at 7:00PM or AM~ five hours at night or in the morning.The buses stop in the heart of the tourist strip in Mui Ne, so there is no need to take a taxi. The cost is about US$6 (105,000VND – Vietnamese dong) each way, and tickets are sold all over the tourist districts of both HCMC and Nha Trang.Several companies run buses directly to Mui Ne, popular with both locals and travellers alike. In HCMC they depart from the Pham Ngu Lao area (where you can also find their ticket office) and in Mui Ne they’ll drop you off and pick you up from your hotel. A train runs daily from HCMC to Phan Thiet, departing at 6:50AM and arriving four hours later. The return trip leaves Phan Thiet around 1:30PM. The train station in HCMC (Saigon Railway Station) is in District 3, about 3 km from the center. The railway station in Phan Thiet is about five km (80,000VND taxi ride) from the beginning of the Mui Ne resort strip, and taxis are abundant to take you there. There is a mid-sized red-color local bus from the station to Mui Ne for which tickets are sold on the train for 35,000VND per person. There are few paid roads on the way to Mui Ne, so taking extra money is common way to increase the bill. Tell the driver, that you want fixed price with all fees included. Using taxi counter will usually increase the bill to more than 110$. The famous Sand Dunes (Doi Cat), on the main coastal road a short distance north of the fishing town at the north end of Mui Ne bay, about 10 km from the main resort strip. The whole region is fairly sandy, with orange sand threatening to blow onto the coastal road in some spots. The dunes that visitors visit are about 50ha (1/2km²) of open sand on a hillside with ten-meter undulations, staffed by dusty children with plastic slides, who will offer instruction and assistance if you want to slide on the sand. Avoid these children at all costs. The plastic slides that they offer are simply an excuse to to steal your belongings when you are not looking. They will offer to carry your bag for you as you go sliding, then steal your phone of wallet, and there are so many boys that you wont be able to tell who did it. The dunes also offer nice views of the sea coast to the north. In all, it’s worth a half-hour visit, especially if you have rented your own motorbike for the day. On the opposite side of the road are a series of small cafes, where you can park your motorbike for a small fee if you ride there on your own. Most day tours sold by local tour operators include a stop at the dunes. The trip by taxi from the main resort strip would be about 150,000VND each way, and less by xe om. It is reachable by bicycle in 30-45 minutes, passing the Fairy Stream on the way. Mui Ne market and fishing harbour (Lang chai Mui Ne). Don’t miss out on an excursion to this quiet little village, at the north end of Mui Ne bay. The coastal road leads straight into the town (with a left turn required to continue up the coast). At the entrance to town is an overlook with a splendid view of hundreds of colorful fishing boats moored in the bay. Further along into town, just off the main road, there is a small but colorful market. If you take your transport just down to the water, you will reach the fishing harbour, where you can purchase fresh seafood (if you have any means to cook it) or purchase steamed crabs, shellfish, etc. to eat on the spot from local vendors. Walking along the beach, you’ll pass by fishermen sorting out their catch, ship-wharfs and, at the southern end of town, a section where clams have been ridded of their shells for many years, so the sand on the beach is by now substituted with littered shells. The Fairy Stream (Suoi Tien) is a little river that winds its way through bamboo forests, boulders and the dunes behind the village, in parts resembling a miniature version of the Grand Canyon. Local kids will want to accompany you to show you the way (and of course earn a dollar or so), but since you’re just following the stream, there’s little need. For the most part, the stream is about ankle-deep and no more than knee-deep even at its deepest. It is sandy with few stones and can be walked comfortably barefooted. You can climb up the red sand hills overlooking the river valley and even walk there parallel to the river, however, the sand may be hot on a sunny day, so bring some footwear. Walking upstream for about 20 minutes, you will reach a small waterfall into at most waist-deep water, great to take a refreshing bath before heading back! To reach the stream, head along the main road towards the east until you cross a small bridge. The stream is underneath, you will see a sign pointing towards a path to the left, go that way to reach an easy place to enter the stream. By bicycle it’s about 15min from the main resort strip and shouldn’t be more than 20,000 by xe om. Kite surfing is offered by many outfitters and hotels. Kite surfing instruction is available, starting at $60USD/hour, beginners package of 7 lessons start at $350 USD. From November till March you generally will have strong winds every day. The Winds in Mui Ne emerge by thermical movements, after the shores got warmed by the sun. You will have perfect wind everyday from 11 a.m. on until the late evening. Gusty winds are seldom. With strong winds, the sometimes choppy waves can be as high as 4 meters and more. The water is free of rocks, which makes it relatively safe to kite. However in the peak season there up to 300 kiters in the water at the same time. Beginners and Students, who mainly practice close to the beach front makes things a bit more dangerous. So watch out for other kitersufers and swimmers and control the speed, in particularly because swimmers are difficult to see when waves are high. Accidents between kitesurfers or between kitesurfers and Swimmers happen from time to time and medical facilities are limited in terms of their equipment and abilities. All-terrain vehicle. You can ride one on White sand dunes. Sailing was newly founded in 2010 in Mui Ne. This water sport has been gaining popularity since Mui Ne is considered one of the best places in the world to sail. Classes are available and offered by Manta Sail Training Centre on 108 Huynh Thuc Khang at $50USD/hour for individuals with certified international and local instructors. This foreign-owned centre is the only sailing school in Vietnam. The sailing area is safe, quiet, with no swimmers and a few advanced kitesufers. Swimming. The sea is wonderfully warm, but it can be quite rough, with large waves and a strong rip tide. When the tide is in, there is not much of a beach to speak of. When wind is blowing it can be quite chilly to even think of swimming. The area between kilometer markers 11 and 13 has the largest stretch of enduring sandy beach. Since large waves normally emerge after 11AM you might prefer to swim in the early morning hours, when the water is flat and free of Kitesufers. Most mid-range and top-end resorts have swimming pools for their guests. Some are open for day users starting at 80,000VND per day. But you can always behave as guest from this hotel and buy a few drinks for these 80,000 dong. Running. Run the annual Mui Ne Half Marathon held on the gorgeous grounds of Sea Links Beach Hotel every September. Racers and spectators can enjoy a family friendly event with distances of 5k, 10k and 21k to choose from. Surfing. Sometimes you get good waves in mornings of windy season. Lessons, day trips and rentals are available, don’t hesitate to ask around. While Mui Ne is not the best destination for surfing, it can be good place to give it a try. Windsurfing. If you like to do some windsurfing, go to eastern part of Mui Ne. Starting from Hai Au resort, there are some hotels that are offering good place to water start, rent or store your gear. Water Sports. Most outfitters offer a host of water sports including kayaking, paddle surfing, and jet ski rental. Joe’s – The Art Cafe, 139b Nguyen Dinh Chieu St, Ham Tien (across from Shades Resort), ☎ +84(0)62-374-3447. 24/7. Joe’s is the only place open 24/7, all night and all day in Muine. It’s a cozy old farmhouse cafe offering Western fare. A Canadian developed the menu, and the pancakes with maple syrup (50,000 dong including coffee) are great. The sandwiches with home cut fries and salad (60,000 dong) are also recommended. Two movies are shown each evening in the pillow-filled loft. Free WiFi, exhibits and live performances. A great place to have your bus pick you up at 2 a.m. when you head out and great for a chill spot for after party breakfast or a romantic glass of wine. drinks 10,000 – 60,000 dong, meals 50,000 – 120,000 dong. Snow Restaurant and Club and Sushi Bar, 109 Nguyen Dinh Chieu St. Snow Restaurant famous for its coolness air-conditioned hall that is unique in Mui Ne. In our restaurant with pleasure you can try dishes from : European, Japanese, Russian and Vietnamese cuisines. All dishes are adapted under European taste and this is give you opportunity to try exotic dishes such as filet of crocodile or unusual fish and don’t lose your enthusiastic for Asian food. Only at Snow restaurant they can offer you sushi and paradise deserts, worlds favorite cheese cakes and sweets from French chocolate! After 10PM when almost all the places in Muyne are already closed come and enjoy the comfortable atmosphere of lounge bar as known as the best cocktail bar in town, where on a special order bartender can prepare for you a cocktail called “Better Mood” which exactly will rise up your mood on a few degrees higher! Evening cinema-sessions will relieve your rest! At Snow restaurant you can use free Wi-Fi Internet, free pool and free transfer from Taxi Malin to the restaurant and back to the hotel! All staff is very friendly and ready to help from 10AM to 2AM! Ocean`s Republic, 120 Nguyen Dinh Chieu (look for the orange Sunumbrellas in front). 08:00 to 01:00. Ocean’s Republic is Muine’s first vocational training facility supporting local youth. They have a full bar and a series of theme nights: Monday, Wednesday, Thursday & Sunday are Mongolian BBQ night; Tuesday & Saturday are German schnitzel night with roasted potatoes and salad buffet; on Wednesday, there is a 25% discount for all wines by the glass; on Friday, there is suckling pig with a salad buffet. Lâm Tòng, 92 Nguyễn Đinh Chiêu, T:062-3847598. is right on the beach next to Jibes under some shady palms. You can even sit at tables in the sand. There’s a little hut with hammocks strung. Try one of the pancakes (bánh xèo) with condensed milk (sữa đặc), the fried fish with lemon, and the chicken fried in fish sauce. Disgusting service even for Vietnam. They always forget to bring some of the food. Price increases in 2013. If you’re in the middle of the Mui Ne strand and want to wring out as much of the day and night as you can then you might consider the Wax Bar if you’re a beach party type or The Club if you like casino, disco, karaoke, billiards etc. For after you party~ Joe’s Cafe is a quiet stop open 24 hours a day and good for late drinks even in low season. “Fun Key Bar”124 Nguyen Dinh Chieu, Easy to recognize with is enlighted palm tree, great place to chill at the end of the afternoon , and later on have a great party with some good sound, they make some good crepes and waffle if your a little hungry, sandwiches are also very good. Free wifi, swinging hammock on the sea side make it a perfect place to be! Open Tuesday to Sunday from 16H00 to 03h00. Be careful, shots bar can make you done very fast. Wax Bar, on the beach at 68 Nguyen Dinh Chieu (beside Rach Dua Tropico Resort; take the alley on the NE side to the beach, pool on your right, bar on your left). By day, it’s a fairly empty spot for hanging out in the shade, watching the kite surfers, playing a little sand soccer or beach ultimate, and enjoying the pool or waves if you are not attached to a resort. It’s a delightful spot at sundown, with pleasant breeze and pastel sky and your choice of beach-side tables, since the cool crowd does not arrive until late. Mats, pillows and torches are set out on the beach below with a pleasant mix of music coming from above. Located north of Coco Beach Resort. As for 2012 only locals are here. The Club, 56-97 Nguyen Dinh Chieu across from Saigon Mui Ne Resort. For the casino, discothèque, billiard, karaoke suite type. Has all the casual elegance you could want. The casino uses all computerized tables, meaning there are no live dealers. The touch-screens are, by admission of the manager, “very sensitive.” If you make bets, even accidental (such as accidentally pressing the ‘repeat bet’ button), they are binding. Gambling here, particularly more so than any other casino, is done at your own risk. Vietnam has no regulations governing these sorts of enterprises, and ultimately a dispute will come down to who can bribe the police more. Lan Anh, Huynh Tân Phát, Mui Né. Coming from Phan Thiet, turn left when entering the village, in the corner where there’s a business called Nhà Tho. Local guesthouse in the village, a couple of kilometers far from the resorts and beaches but close to shops, market and street food stalls. Perfect for experiencing local life. Owner family can barely understand english but are nice. Room with 2 double beds, fan, fridge, toilet and tv. Free WiFi. 150.000 VND / $7,5. Keng Guesthouse, 185 Nguyen Dinh Chieu (About 100m east of Phuoc Thien Pagoda), ☎ 062-3743312 (yongkeng999@yahoo.com). Simple and clean guest house with all the usual facilities on the quiet end of the main strip, about 15min walk to the bar and restaurant area. Very fair prices for food, fruit, or drinks. The owner can speak decent English and is very friendly, she will try to help you with whatever you may need. Dorm 100,000, rooms from 160,000. Thien Son. 102 Nguyen Dinh Chieu. Tel. 062 3847187 / 0918 610727(mob) Guest house just down the road from Joe’s cafe with clean, large rooms with fan or a/c($2 extra). Double rooms $12.Can get breakfast for about $1. Very friendly people though English is limited. Also organise the cheapest tours to sand dunes in town(depends on size of group, but from $4-$9) as well as buses to Saigon and Nha Trang. Grace Boutique Resort at 144A Nguyen Dinh Chieu Street has the looks of a Mediterranean Villa from the street. This is definitely a mid to high end ’boutique’ hotel. There are only 14 rooms, all very well appointed and with seaviews. The resort strong points are its well-trained staff, efficient and friendly service, a beautiful garden and a charming infinity pool. Rates include daily breakfasts. Discounts are offered during the low season and for long term stays. It is advisable to book well ahead during the holidays. Shades Resort across from Joe’s Cafe at 98a Nguyen Dinh Chieu Street Has 8 lovely studios/apartments complete with kitchens, jaccuzzi or rainshower, preloaded computers and 42 inch sony flatscreen TVs and a lovely view. The site includes a lovely swimming pool and a bar with Bon Cafe coffees made with fresh milk from Dalat. Prices drop to less than half in low season and there are also long term rates available, but generally you can think of it as 45-200 USD a night. Rates include daily breakfast, daily bottled water, laundry service. Great view, the beach is wider or narrower according to the season. Several travel agencies along the strip also double as used book stores. Most have a few shelves of English books, along with a small selection in German and French. Books cost 80,000 – 100,000VND and most shops will cut the cost in half if you trade in a book. Coop Mart, Phan Thiet (corner of Nguyen Tat Thanh and Tran Hung Dao), ☎ 3.835.440 – 3.835.455. 8:00AM – 9:30PM. A large, Western-style grocery store that also sells books, jewelry, and necessities. If you can’t find what you’re looking for in Mui Ne, you may have better luck here. Note of Warning on one tour company: Victor Tourist Company (part of Victor Cafe) charges a cheap price 300,000 – 340,000 dong to Hoi An, however, the overnight bus was severely overloaded with people sleeping on the floors and make shift beds placed over the bathroom. Not what you get from other tourist companies like Sinh Cafe.